Discover exactly where you are. Find nearby restaurants and businesses. Get turn-by-turn directions for driving or walking from any address to any other address. See real-time traffic information for most urban locations. The biggest difference between the two apps is that the Google Maps app offers information about traveling via public transportation for most major cities. Sadly, although the Apple-powered Maps app was upgraded and now offers info on public transportation, the info is available for only a handful of cities at present. 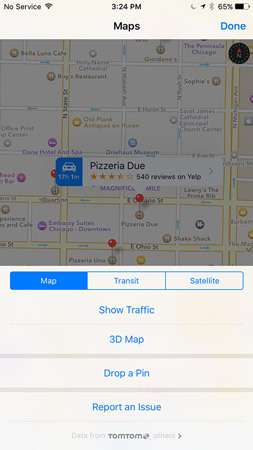 The free Google Maps app is available in the iTunes App Store, with directions for using public transportation in more cities than the Apple Maps app. You can keep both apps on your iPhone. Let’s start with something supremely simple yet extremely useful: determining your current location. Here’s how to find yourself: Tap the Maps icon and then tap the show current location icon, the little blue arrowhead shown in the margin and found in the lower-left corner of your screen. If yours is an iPhone 6s model, you can press the Maps icon and choose a quick action to open Maps; your choices are Search Nearby, Send My Location, Mark My Location, and Directions Home. 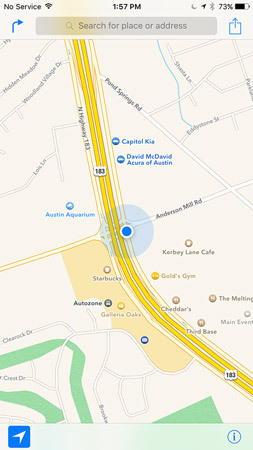 When the phone’s GPS is used to find your location, a pulsating blue marker indicates your current location on the map. In addition, the Location Services indicator, an arrowhead, appears to the left of the battery indicator in the status bar. The blue marker shows your location. If GPS is not being used because you’re out of the satellite’s sight line, a somewhat larger pale blue circle shows your approximate location. Either way, when you move around, the iPhone updates your location and adjusts the map so that the location indicator stays in the middle of the screen. If you tap or drag the map, your iPhone continues to update your location but won’t recenter the marker, which means that the location indicator can move off the screen. Tap the show current location icon to move the current location marker back to the center. When you tap the show current location icon, it turns dark blue, which indicates that your current location is in the middle of the screen. If you tap, drag, rotate, or zoom the map, the icon turns white with a blue outline. So, if the icon is all blue, your current location is currently in the middle of the screen; if the icon is white with a blue outline, your current location is anywhere except the middle of the screen. Unless, that is, you’re using the transit or satellite view, in which case you’ll see gray instead of blue. To find a person, place, or thing with Maps, tap the search field at the top of the screen to display the keyboard. Now type what you’re looking for. You can search for addresses, zip codes, intersections, towns, landmarks, and businesses by category and by name, or combinations, such as New York, NY 10022; pizza 60611; or Auditorium Shores Austin TX. If the letters you type match names in your Contacts list, the matching contacts appear in a list below the search field. Tap a name to see a map of that contact’s location. The Maps app is smart about it, too, displaying only the names of contacts who have a street address. When you finish typing, tap Search. After a few seconds, a map appears. If you searched for a single location, it’s marked with a single pushpin. 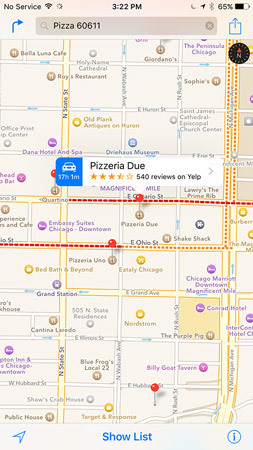 If you searched for a category (Pizza 60611, for example), you see multiple pushpins, one for each matching location. Search for Pizza 60611 and you see pushpins for all pizza joints near 60611 (downtown Chicago). 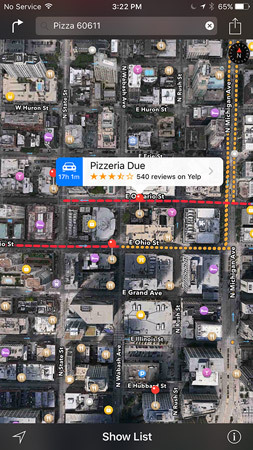 The Maps app is adept at interpreting search terms and finding the right place. Whenever you search for anything in Maps, eight new icons pop up just below the search field: Food, Drinks, Shopping, Fun, Transport, Travel, Services, and Health. Tap an icon to see nearby establishments of that type. Now here’s a look at some ways you can use what you find. But first, let’s take a little detour and explore how to work with what’s on the Maps screen. Three views are available at any time: map, transit, and satellite. Here’s a satellite view. Satellite view of a map. Select a view by tapping the little i-in-a-circle in the lower-right corner of the screen. An overlay appears, revealing several buttons. Tap the little i-in-a-circle to reveal these buttons. The transit view is just the map view with added information about bus and train routes and stations. At present, it’s available only in a few cities, with the promise of additional cities sometime in the future. To zoom out: Pinch the map or double-tap using two fingers. To zoom out even more, pinch or double-tap using two fingers again. To zoom in: Unpinch the map or double-tap the spot you want to zoom in on. Unpinch or double-tap with one finger again to zoom in even more. To rotate: Rotate two fingers on the screen. Note that the compass in the upper-right corner of the screen rotates in real time as you move your fingers. To scroll: Flick or drag up, down, left, or right with one finger.